Notorious RBG. Run to work, listening to yesterday’s episode of the NYT Daily podcast. Quick, efficient work day, ending with s ‘Metabolic Conditioning’ class at 5:30pm at the office gym. Walk over to Liberty to meet a friend and buy gifts for a baby shower we’re throwing for a friend on Sunday. We start out by saying that we wanna make it classy and avoid buying clothes, as we might get the style wrong, and 30 minutes later we leave the store with unicorn balloons and Liberty printed minishorts, haha. Oh well. Walk down through Soho, chatting about this and that, me really enjoying that this is all possible – I have this life here that I just fit right into. Eat at Whole Foods and drop into Picturehouse Central (cute cinema, by the way!) to watch RBG, so thought-provoking, laughter-provoking, in all respects touching and inspiring.. such a modest, reserved, serious, warm, loving, kind, just woman… rather than protesting in the streets in the ‘70s, she took her passion for gender equality and women’s empowerment to the biggest courthouses in the US and changed so many laws with her eloquence, certainty, patience, persistence… she is funny and adorable, so empathetic and good, so full of love and gratitude for her forward-thinking, modern, outgoing and supportive husband, who is a vital part of the reason why she was able to do what she has done, but most of all I’m just struck by the fact that someone so shy and introvert woman has become such an important public figure. It’s admirable that she believed, has been believing, still believes in her cause so strongly that she is able to step forward to the degree that she did, has done, is still doing. Wow! Colette. Another film based on a historic strong female character, another evening in London with a sweet friend from back in the day, this time in Angel. 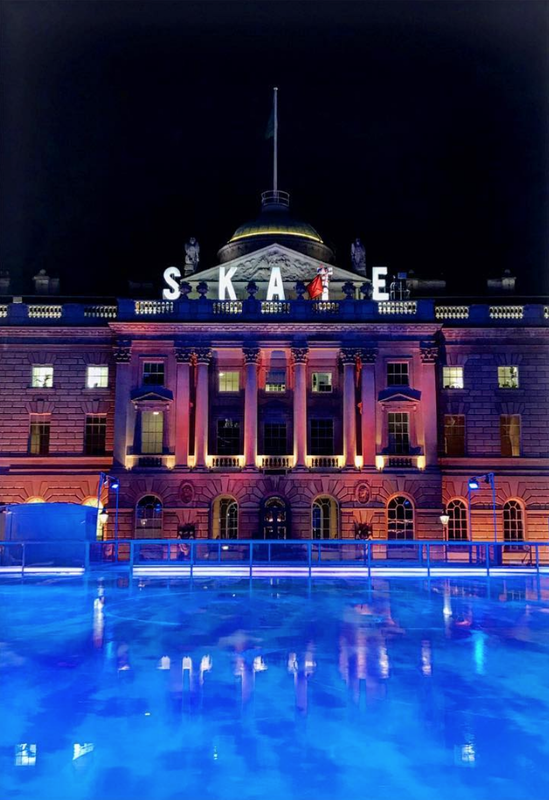 Ice skating at Somerset House. So much fun! I go with two old colleagues, Italian and Bulgarian, from TripAdvisor; we drink a glass of wine in one of the bars in the beautiful building, and then queue up for our 45 minutes on the rink. I just love ice skating so much, haha! It’s one of those activities, like swimming or skiing, where I just don’t think about anything other than how much fun it is. I am not particularly good – can’t do any pirouettes or tricks – but I enjoy slowly feel how your body gets increasingly into the swing of things with every loop. Copenhagen. Landing at 9:50am on Friday, I have a whole day at home … yes, home is where I am, it’s where Sanoop is, it’s where we create one, in Singapore or London, or where it just feels right, such as Byron Bay… BUT… All of that said, I must admit, there’s a feeling about landing in Copenhagen and seeing it from above, hearing Danish spoken at the airport, seeing the design of things and mannerisms, the landscape from the metro, the neat cobbled streets, charming colourful houses, canals… an incredibly grounding and right feeling that will always – no matter where I live and whether I never get to live here again – make this feel like home. A safe, neutral, orderly place and state of mind. Ah, I’m veering off with my usual home talk … I’m here today. Because I’m going to a funeral on Saturday. I don’t want to get into details about that; I’ll just say it’s a horrific, tragic, shocking story of someone who passed away way too young and leaving a pregnant wife, my friend, and a 3-year-old daughter behind. Tough as it is, I am grateful that I’m able to be here. On Friday, I work from the Copenhagen office, which is an interesting experience. The office is beautiful, of course, Google flavours in a very tasteful Danish interpretation, located in a quaint little lane in the downtown Latin Quarter. I find a nook just off the canteen where I can sit comfortably all day and do my thing. As I hear people walk by and sit around me, it hits me that this is the first time I’ve been at a Danish workplace. In my mind, Danish and work are two separate entities – it’s so peculiar to hear people discuss the same things that I work on in the language that I usually associate with completely other aspects of life. Hehe. A friend comes over for lunch, as her office is just next door, and after work, I walk slowly through my favourite old streets, loving how lively and well-maintained they appear, with so many new and sparkly things going on, and I feel deeply thankful that this is the way it’s going; every time I’m here, Copenhagen seems more modern yet true to good things about its heritage. I meet one of my best friends and her boyfriend for dinner, and crash on an air mattress in their living room before 10pm. They just moved back here after 4 years in California, where they ran an ice cream parlour on Hermosa Beach. Horrible occasion; really nice that I get to spend time with loved ones. The next day is tough for everyone present in the church and following reception, but especially made tough by the thought of how infinitely tough it must be for the widow and those who are really close to the guy who passed away – his parents, sister, close friends. Afterwards, in the late afternoon, I walk from Kastellet, where the reception was held, to the centre of the city and meet another close friend for a glass of wine and dinner to digest the impressions and for some comfort. It’s also a comfort knowing that the widow is surrounded by loved ones, who will take good care of her and her children. Baby Shower in Islington! And speaking of children… from honouring life in one sad way on Saturday, I walk down through Belsize Park, Primrose Hill and Marylebone to pick up a Danish cake and alcohol-free Prosecco to take to the joyful celebration of a life about to begin. We surprise our pregnant friend in another friend’s house, which we have filled with the unicorn balloons, baked goods, bubbly goods and sweet girls, who flew in from everywhere from Mexico to the British Virgin Islands to Copenhagen to be here today, haha. Luckily my friend seems to really appreciate our efforts – including the Liberty print minishorts.